This program is based on the premise that students will be exposed to a wide range of concepts and technical skills to help build foundational skills in the following areas: software development, computer programming, and graphic design. Instruction and application of the developmental process of gaming, from the story board, through research and then, to the marketing process will offer students opportunity to develop creative, innovative and critical thinking skills. While developing programming skills, students will learn through the following methods: drag-n-drop, programming, writing code, as well as learning technical and increasingly complex programming instructions. Additionally, skills in creating and programing games, authentic to the student, using digital design resources and color theory to draw and animate sprites, objects, platforms, backgrounds and loops will be addressed. Troubleshooting existing game programs to fix bugs and ensure optimal performance will enhance critical thinking skills. Finally, students will learn the skill of technical writing in the following areas: user instructions, game directions, game rules and document development process within a development team. Project Lead The Way is the nation’s leading provider of science, technology, engineering, and math (STEM) programs. Through world-class K-12 curriculum, high-quality teacher professional development, and outstanding partnerships, PLTW is helping students develop the skills needed to succeed in the global economy. 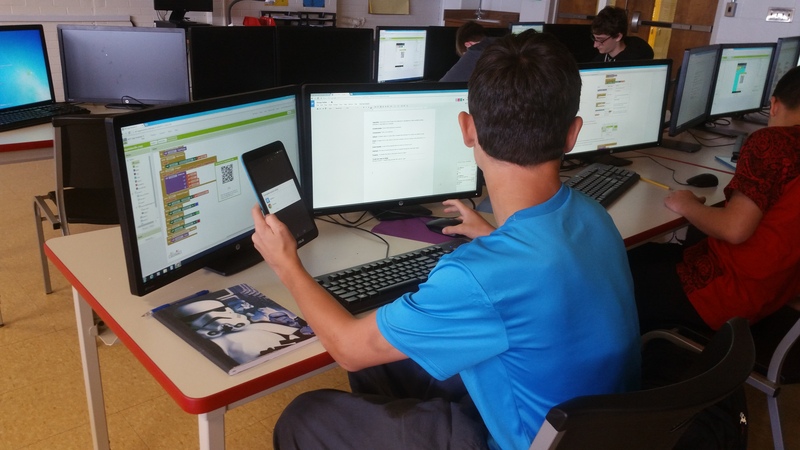 Designed to be the first computer science course for students who have never programmed before, ICS is an optional starting point for the PLTW Computer Science program. 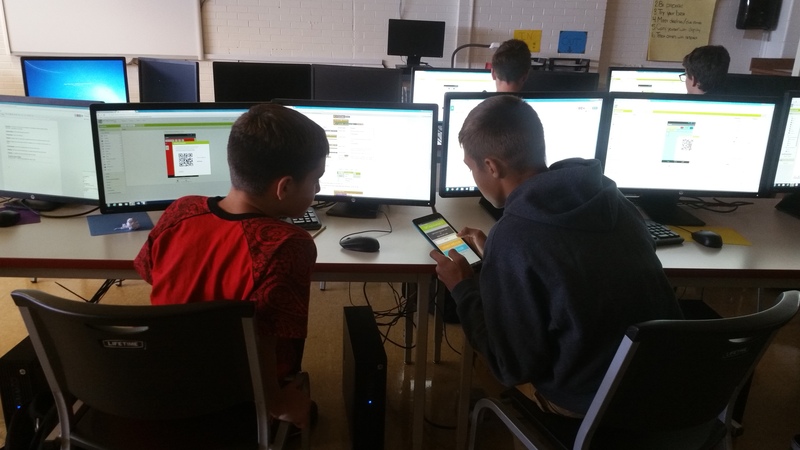 Students work in teams to create simple apps for mobile devices using MIT App Inventor®. Students explore the impact of computing in society and the application of computing across career paths and build skills and awareness in digital citizenship and cyber security. Students model, simulate, and analyze data about themselves and their interests. They also transfer the understanding of programming gained in App Inventor to learn introductory elements of text-based programming in Python® to create strategy games. The course aligns with the Computer Science Teachers Association (CSTA) 3A standards. A team of high school students from East Providence Career & Technical Center, recently concluded an exceptional round of competition in the eighth season of CyberPatriot – the National Youth Cyber Defense Competition. Established by the Air Force Association, the CyberPatriot National Youth Cyber Education Program was created to excite, educate, and motivate students toward careers in cyber security and other science, technology, engineering and mathematics (STEM) disciplines critical to our nation’s future. CyberPatriot’s core program – the National Youth Cyber Defense Competition – challenges teams of two to six students across the United States and Canada, and from Department of Defense schools abroad, to find and resolve cybersecurity vulnerabilities in simulated environments. The CyberPatriot field is divided into three divisions – the Open Division, the All Service Division, and the Middle School Division. The Cynatics, a team from the East Providence and Career Center participated in the CyberPatriot Competition. They started their journey in October by putting many hours in after school to practice. They competed in two qualifying rounds and placed 4th in the State for Round 1, and placed 3rd in the State during Round 2. Their work placed them in the Gold Division for the State Competition. They competed in the State Round on January 31 and placed 3rd in the State which qualified them to move onto the Northeast Regional Rounds on January 20. Led by Mrs. Piros the team’s Coach and Mr. Gawel, the team’s Mentor, the team of students from East Providence Career & Technical Matt Azevedo, Corey Motta, Jeff Pereira, Alex Buteau, Andrew Holstein, and Edward Crevier excelled in the CyberPatriot VIII qualifying rounds, demonstrating teamwork, critical thinking skills, and technical knowledge key to a successful career in cybersecurity. The team’s performance earned it a spot in the Northeast Regional Open Division Round held February 19-21, during which they outscored other teams to place 8th in the Open Division’s Northeast Region. In all, 3,379 teams registered to compete in CyberPatriot VIII.